14 Dec. '11. 7pm - 1am. 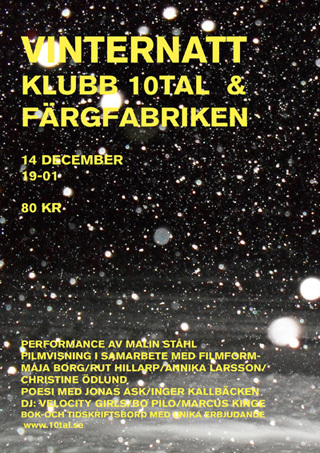 In collaboration with the Magazine 10TAL Färgfabriken in Stockholm are presenting an evening of performance, artist videos, poetry and a party. I have been invited to perform Walking Cinema. 29 Nov. '11 - 14 Jan. '12. 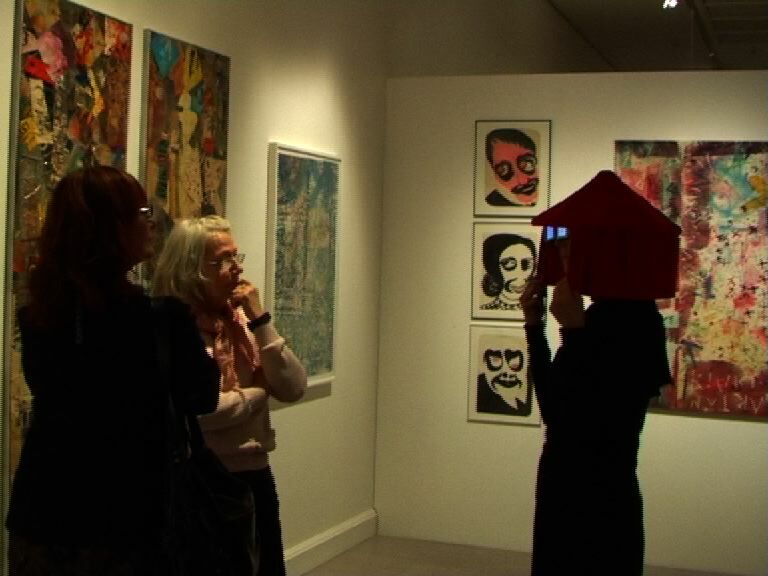 A group exhibition on the subject of family and things that one wanted to do but did not have the chance to . I am presenting a mirror for Jane which will become a collaboration with Jane Motin. 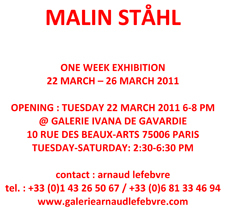 Organised by Arnaud Lefebvre at Galerie Ivana de Gavardie, Paris. 27 Nov. '11. 2 - 3 pm. For the Finissage of Ragna Berlin's installation 'En blomma slår ut i rummet' at Candyland in Stockholm I will perform Finishing School; Karyatid. 17 - 22 Oct. '11. Going Nowhere will be screened in the 'Turtle Salon' at Galerie Ivana de Gavardie in Paris, coinciding with the charity concert by re-united New Order to raise funds for Michael Shamberg. 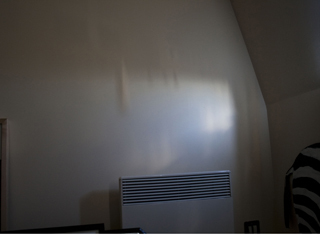 There will also be a presentation of the project 'EMPTY ROOMS WITH CASUAL SOUNDS' initiated by Julian Mereuta. 15 Oct. - 15 Nov.
TJ Boulting presents the inaugural exhibition of the gallery by welcoming back to London Icelandic artist-lead gallery Kling and Bang. Previous Kling & Bang projects in London include The Tower of Now at Tate Modern's No Soul for Sale in 2010 and Sirkus, a demolished Reykjavik bar re-erected by Kling & Bang for Frieze Projects in 2008. Here they will be showing a program of predominantly video from their archive of over ten years, incorporating the work of over 60 Icelandic and international artists as a dynamic VJ installation, along with other new and recent work, and on the opening day, performance, music and a custom-built bar the artists have created in the space. 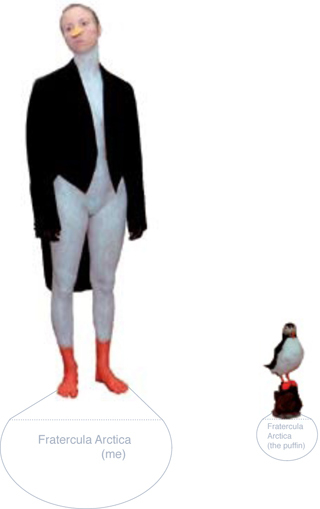 For the finissage of the Kjartan Slettemark retrospective 'Kjartan i stan', I will perform Walking Cinema. At Jamtli Museum in Östersund. 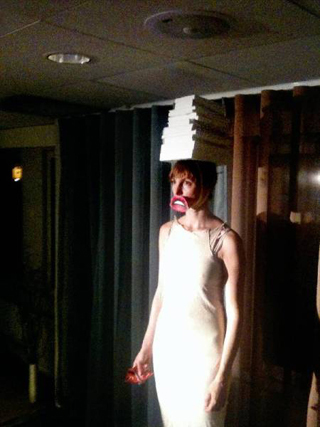 For the opening of Konstens vecka in Östersund I have been invited to do a performance. 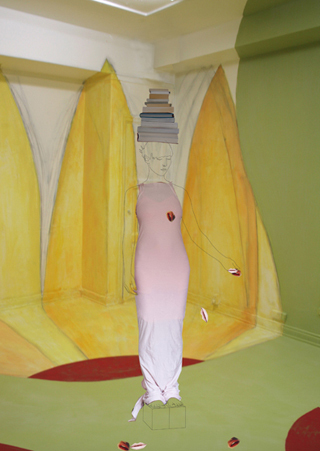 I will present a new work titled Finishing School; Karyatid at the Clarion Hotel in Östersund. 13 Aug. - 9 Sept. '11. 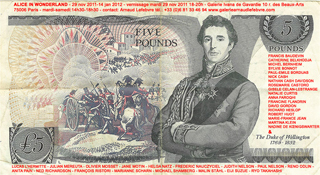 Exhibition extended to 18 Sept. 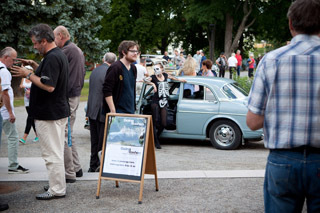 Exhibitions with Ulf Olausson, Malin Ståhl and Ulf Wahlberg at Fullersta Gård in Huddinge. 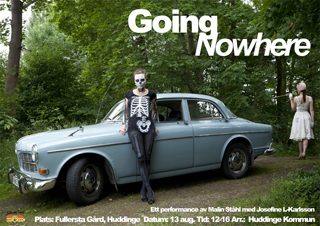 I will be presenting an exhibition of a new set of works titled Going Nowhere including a performance on the day of the opening. 25 June - 24 July '11. 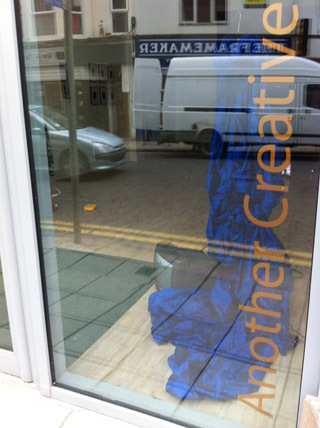 Over Seas is a group exhibition with Rikke Lundgreen, Helen Smith, Malin Ståhl and Anita Wernström and part of the Folkestone Triennial Fringe. Curator Sofia Nilsson. Opening 15.00 Saturday 25 June. Performance 'Venus (Flaming June)' by Anita Wernström 21.00. 4 June - 9 July '11. 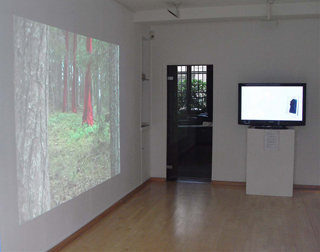 An exhibition of a selection of the video archive of Kling & Bang Gallery (Reykjavik) at Dorothea Schlueter Gallery in Hamburg. 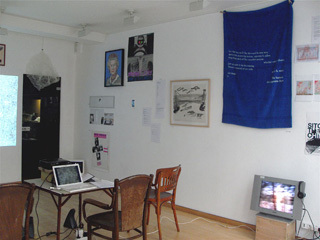 “Agency Of Unrealized Projects“ (AUP) is a project by e-flux and the Serpentine Gallery London devised by Hans Ulrich Obrist, Julieta Aranda, Anton Vidokle and Julia Peyton-Jones. 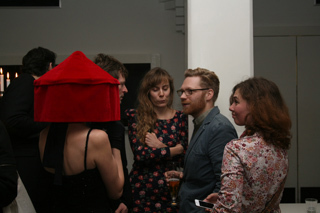 Julian Mereuta: Project with Friends. Receiving the Karin Engelfeldt Memorial Fund Grant I will give a short talk on my work. 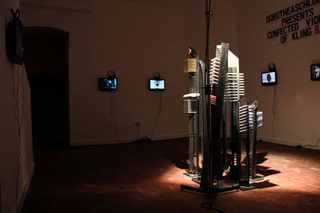 There will be a screening of a selection of video work and performance documentation. 22 - 26 March '11. A solo presentation of a selection of my video works. 23 Jan. - 31Mar. '11. Curated by Regine Basha 'An Exchange With Sol LeWitt' takes place at Cabinet in New York and at MASS MoCA in North Adams, Massachusets. Following an open call for submissions I decided to send the spirit of Mr. LeWitt a set of Characters to play with. He's received a set of seven to make his very own Theatre of Me when visiting MASS MoCA. 18 - 20 Feb. '11. We Didn't Say No will be screened as part of Propeller Island's launch of PITV at the SUPERMARKET 2011 Art Fair in Stockholm. 18 - 22 Jan. '11. We Didn't Say No will be screened as part of 'Turtle Salon in Paris' hosted by Michael Shamberg at Galerie Arnaud Lefebvre. 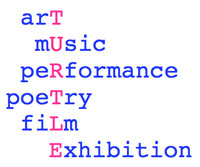 * Turtle an anarchic salon, "an open and chaotic network of diverse but interconnecting ideas, people, projects, events and venues" started by filmmaker Michael H Shamberg in London in 2006, with subsequent events in Düsseldorf, Paris, New York and Baltimore.